It's a sad coda for Ken Kutaragi, the creative genius behind Sony's videogame consoles. He's stepping down at a time when rival Nintendo is teaching its rival important lessons about consumers, writes Business 2.0's Chris Taylor. (Business 2.0 Magazine) -- Pity poor Ken Kutaragi. The creative genius behind Sony's videogame consoles -- the PlayStations 1, 2 and 3 -- announced Thursday that he would step down as CEO of the company's games division, which means his career there will end on a sour note, the sound of defeat. As noted in the latest issue of Business 2.0 Magazine, the eagerly-anticipated PlayStation 3 has already lost this round of the console wars to its Japanese rival, Nintendo's Wii (See "Why Wii Won," May). Since late last year, when both consoles were released, the Wii has consistently outsold the PS3 in every major market. Sony's PS3 is packed with costly gee-whiz features that turned out to be a drawback to consumers faced with choices. Nintendo's Wii simple, elegant design and low price are two reasons it's consistently outselling the PS3. For Nintendo, the number 3 company in the videogames business, it's a David-vs.-Goliath turnaround. For Kutaragi's team, who ruled the roost of this industry for 12 years, it's a shameful final defeat. "Father of PlayStation" says "Game over"
There are a number of lessons we can glean from this -- not just for the future of videogame consoles, but the future of consumer electronics. Decades from now, PS3 vs. Wii will be remembered as a cautionary business tale: how pride, politics, and an overabundance of technology can blind you to the simple truth of what consumers want. Kutaragi chose to pack the PS3 with as powerful a technological punch as possible. It contains a 60 GB hard drive, a state-of-the-art graphics chip, and the ultimate electronic brain, the Cell processor. Developed by Sony (Charts), Toshiba and IBM (Charts, Fortune 500), the Cell is an amazing beast that can do seven tasks at the same time. It also helped drive up the cost of the PS3 to $600, a near-record price for a console, and put Kutaragi's division in the red to the tune of $1.7 billion. The Wii cost just $250. (See corrections). For all that innovation in the PS3, one thing didn't change: the controller, that handheld mess of buttons so confusing to non-gamers. Sure, Kutaragi made it work wirelessly, which has no doubt saved the world from a few broken ankles and smashed glasses, but the controller itself looks identical to the one found on the PS2. Why change something that is already installed in 200 million homes worldwide? Answer: because there are more people in those homes that don't play games, and hundreds of millions more homes to win over. Nintendo's answer to Ken Kutaragi -- Mario Bros. creator and games world legend Shigeru Miyamoto -- knew this better than most. That's why he designed a revolutionary controller that is sensitive to motion, not button-mashing. Everyone knows how to swing a golf club or a boxing glove in a Wii game. You just swing the controller. Over at Sony, Kutaragi was too busy thinking about how to push the company's other technologies. 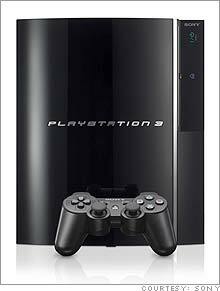 The PS3 was to create a vast installed base for Blu-Ray DVD, one of the rival formats in the ongoing high-definition DVD wars. All well and good if you're thinking about buying a PS3 as a DVD player, but gamers complained that the speed of the Blu-Ray drive was too slow when doing what drives in consoles are supposed to do: load games. Indeed, the PS3 may be the chrome-trimmed headstone on the grave of convergence. It has been a long-held, oft-stated dream of both Sony and Microsoft (Charts, Fortune 500), creator of the Xbox and the Xbox 360, that videogame consoles are little Trojan horses. Nintendo took a different tack. When you buy a videogame console, the company says, you want to play games. Period. A console is not a Swiss Army knife. It makes sense to squeeze more functionality into your cell phone because you carry that device around everywhere. When it comes to the interactive fun box in your living room, however, it makes sense to simply make that more fun. If you want a DVD player, you'll buy a DVD player. The Wii may not be the most powerful console ever built, but it is the smallest and lightest. Its chip is not faster than Sony's cell, but it does use less electricity. In short, it looks more like the future. As Ken Kutaragi moves into the next phase of his career at Sony, as the company's senior technology adviser, he would do well to play a few games on the Wii, and consider how the lessons of this device can help drag Sony away from an even greater defeat. (Corrections: An earlier version of this story incorrectly stated that the Nintendo Wii costs $150 and that the PS3's $600 price was a record for a game console. We regret the errors. Return to story).